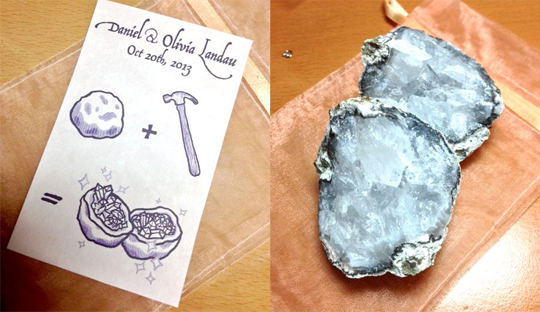 Handmade Things | Dan & Liv got Married! 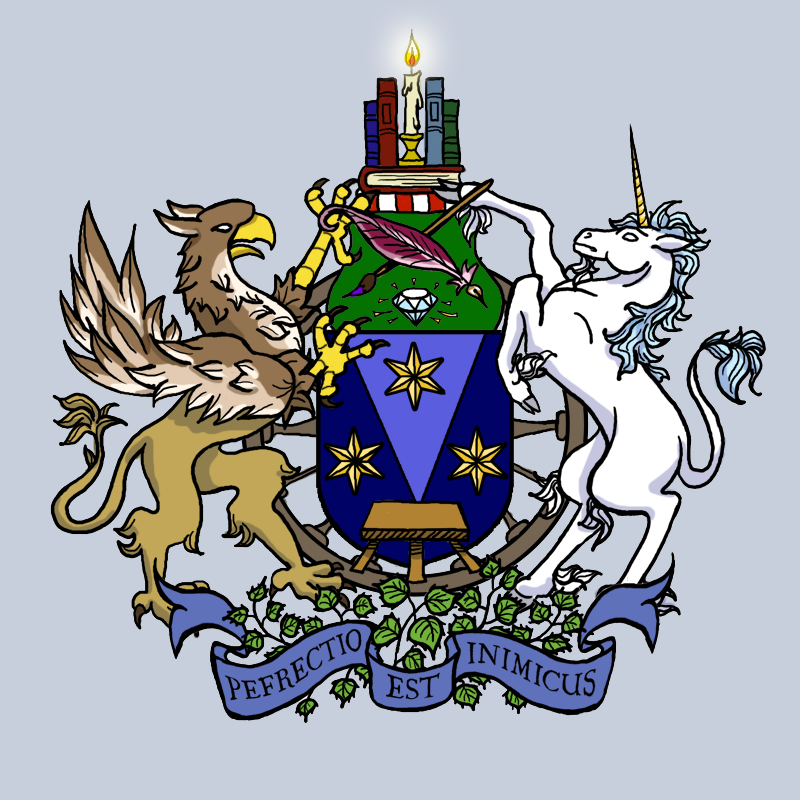 The family crest was designed and drawn by Liv. She and Dan sat down to pick out the traditional heraldry colors and icons that held meaning for them, as well as new symbols that represented their modern way of life. 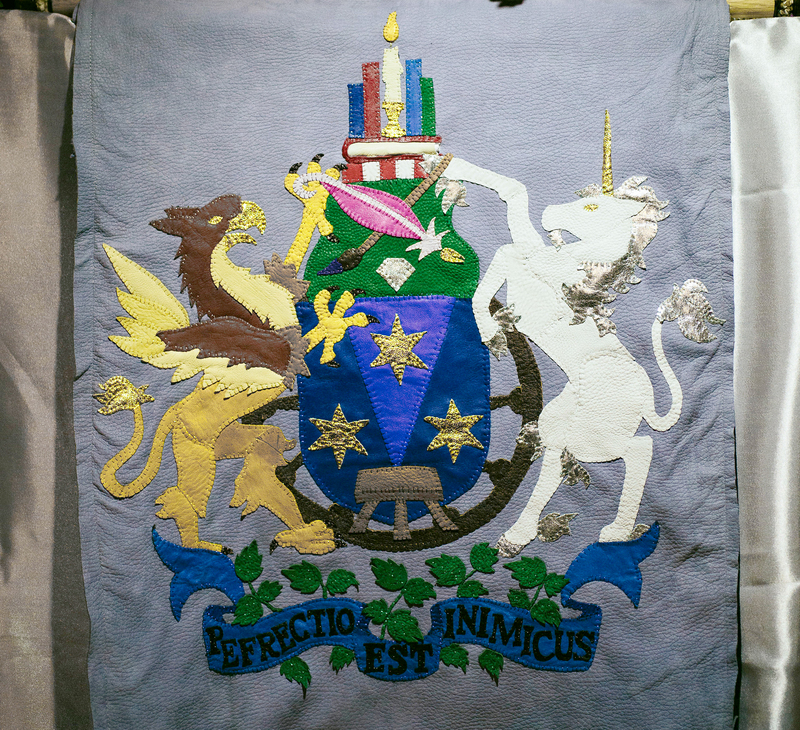 At the wedding reception, a banner displaying the crest was hung at their table. This was hand sewn by the very talented Megan Smithyman. You can see the rest of her work here. The design was inspired by pop-up paper craft castle cards, drawn and designed by Liv. 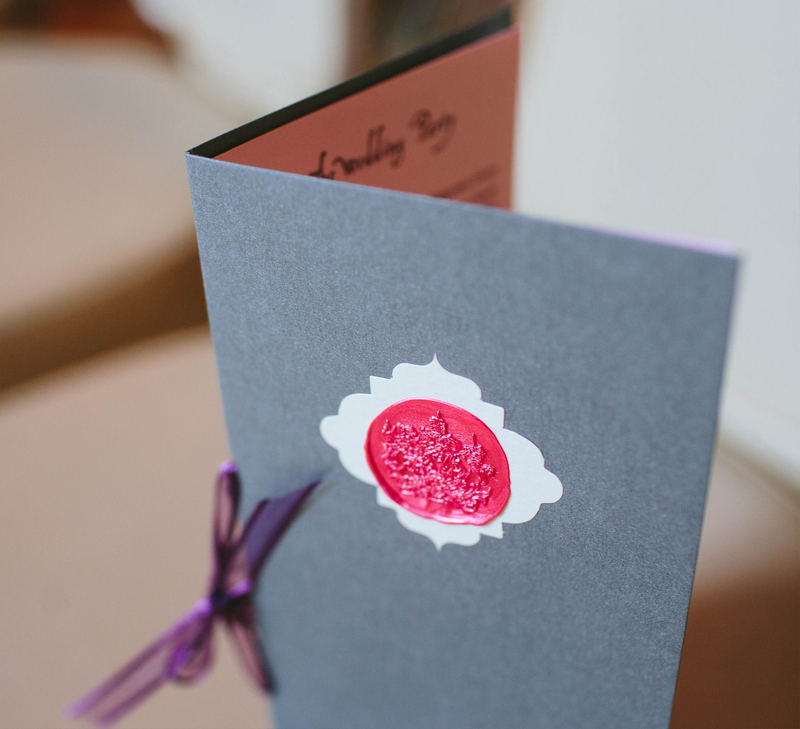 Each invitation was hand cut, assembled by the bride and groom. It was then wrapped in ribbon and stamped with wax using our family crest. 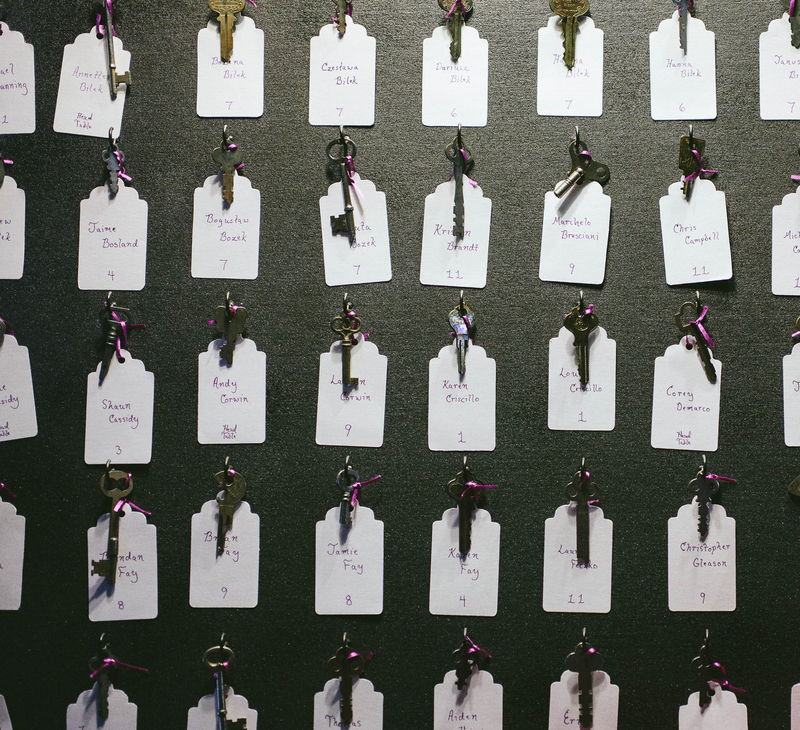 Instead of folded cards, we opted to take over a hundred genuine antique skeleton keys and string them to tags with each guests’ name and table number. 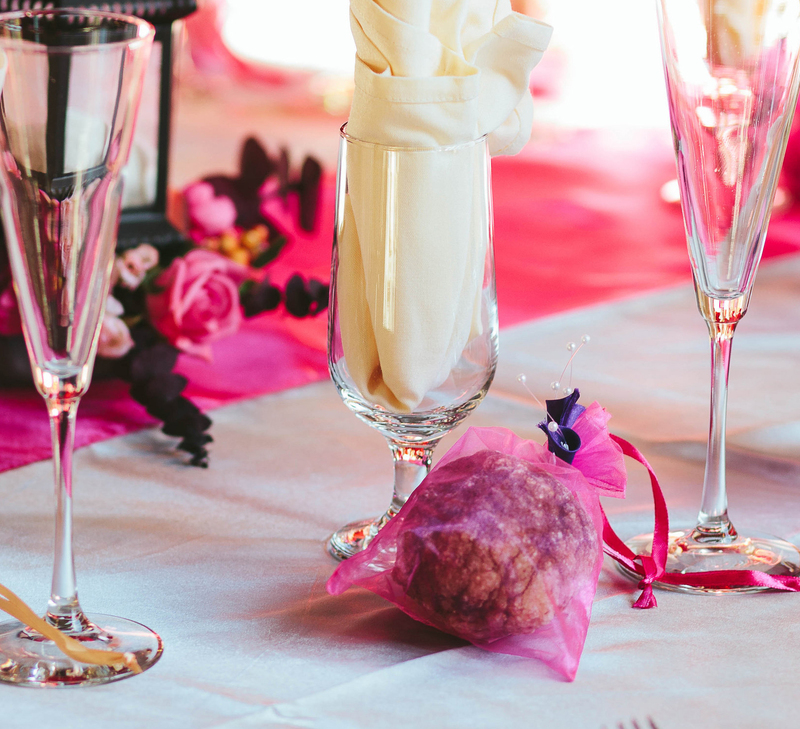 The favors were inspired by our love of rocks. What appears to be a big boring rock inside a sheer sachet is actually a geode. Instructions inside the baggie instruct the guest to smash the rock with a hammer, to reveal the beautiful crystals inside. 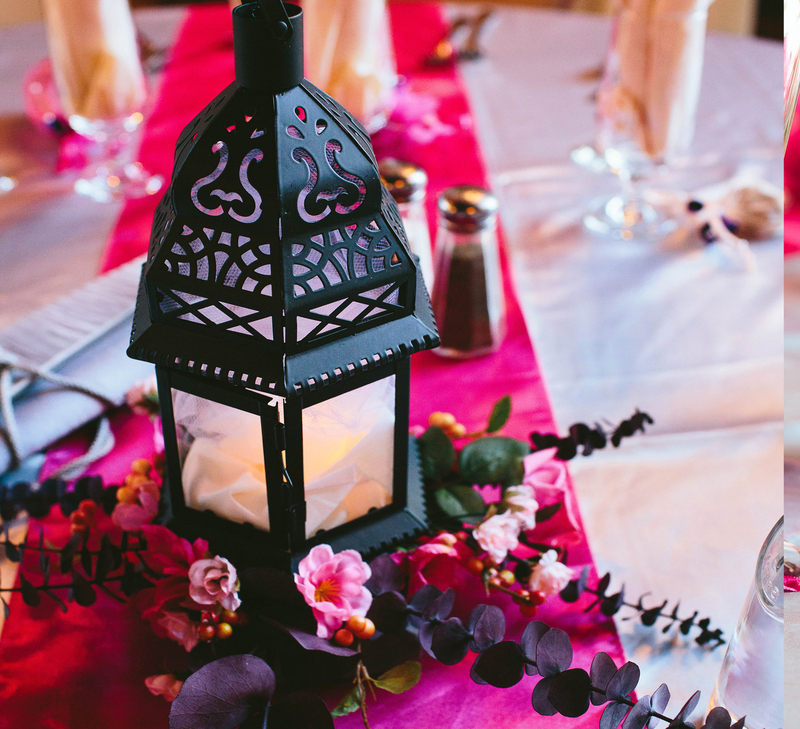 Moroccan Lanterns were lit with flameless candles inside cradles of tulle. 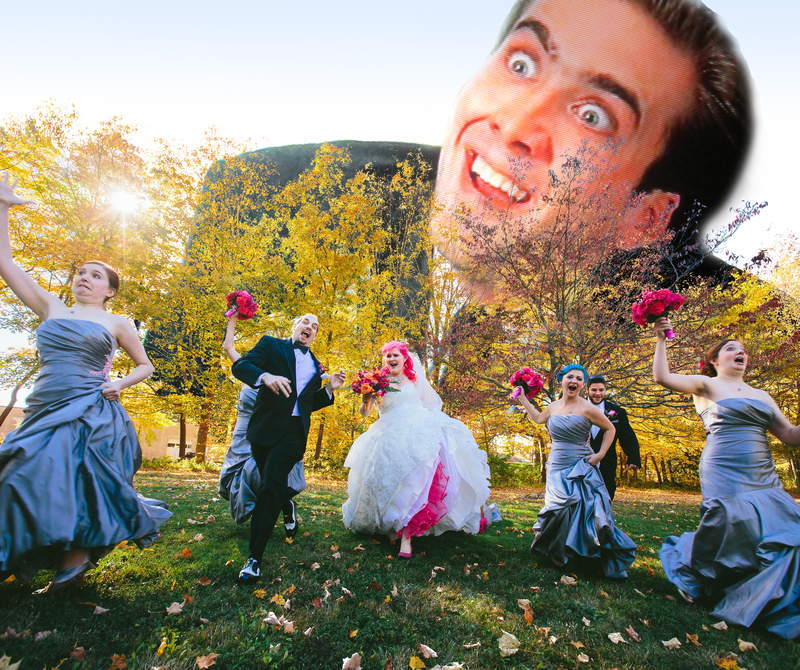 They sat atop an arrangement of silk flowers, done by the bride. 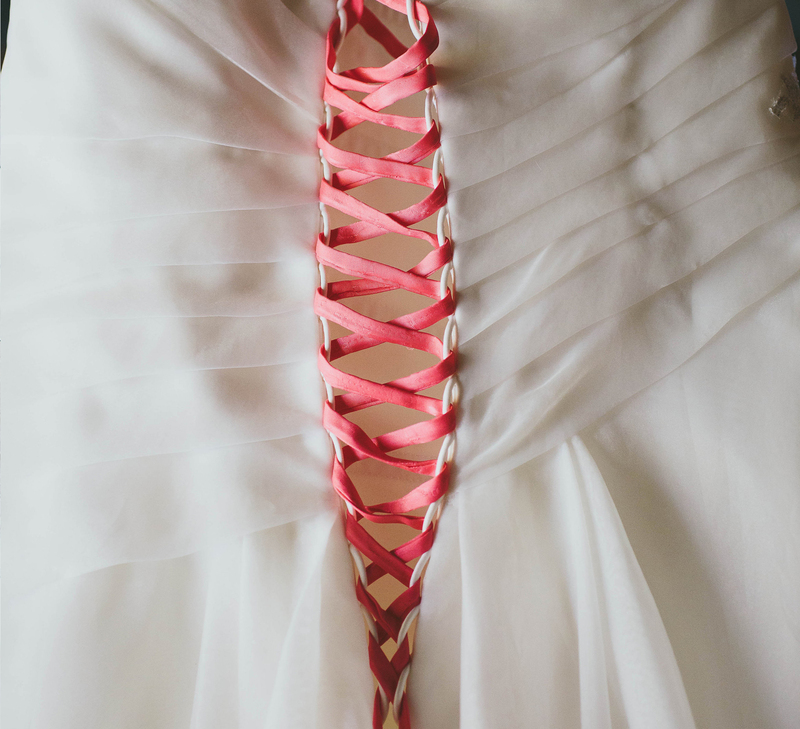 The Brides dress was purchased at a boutique, but she replaced the corset strings with hand-sewn ones to match her hair. 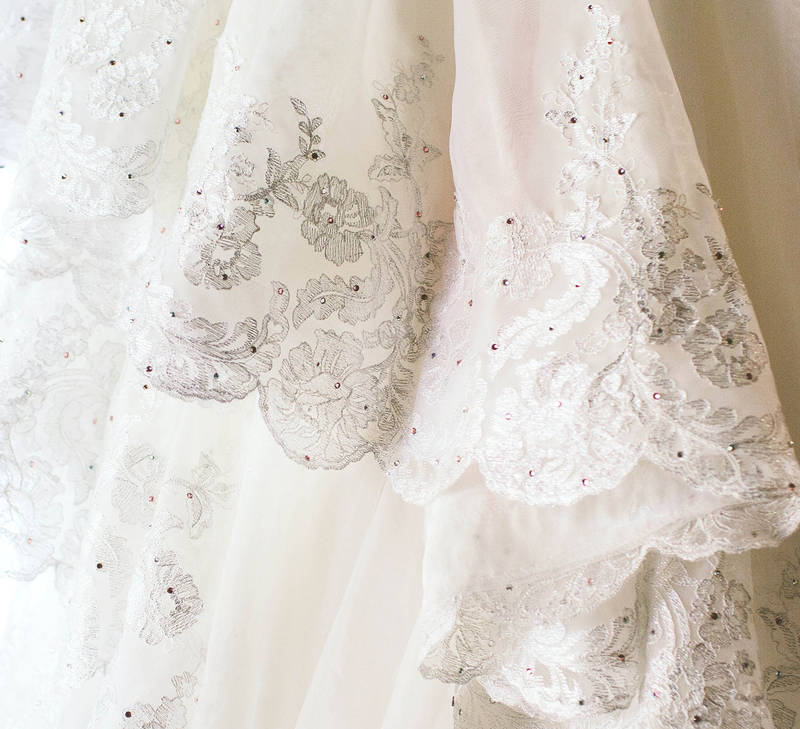 She also added over 4000 rhinestones on the hem of her dress. 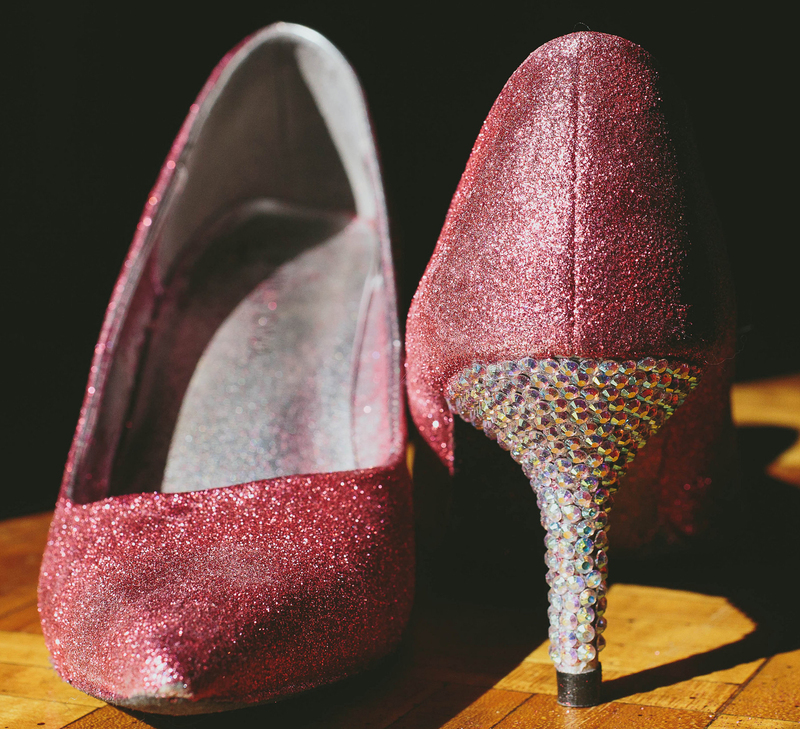 The shoes were glittered and more than 300 rhinestones were added to the heals. 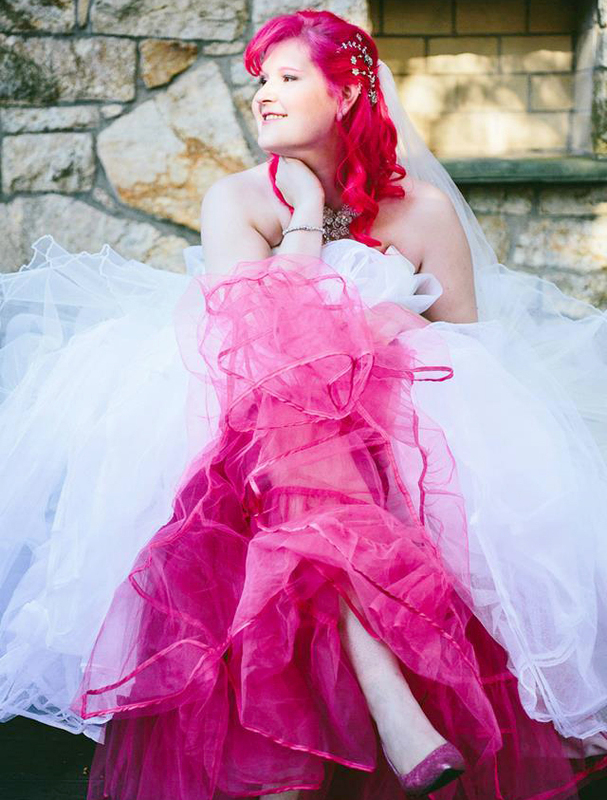 I also added two petticoats, one big white one for volume, and a ruffly hot pink one for some extra color pop! 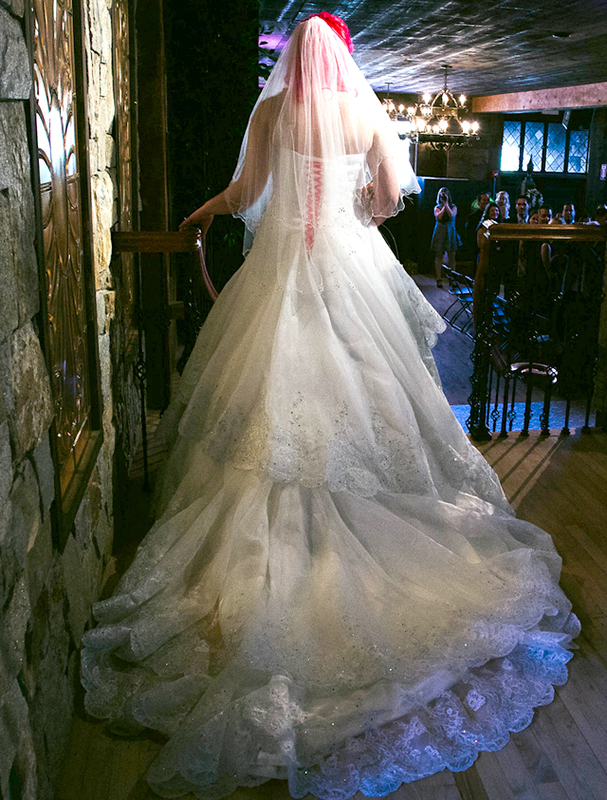 While I didn’t make the petticoats myself (The pink one was provided by Pettiskirt Style), it was quite a DIY project to make the dress come together as a coherent ensemble. 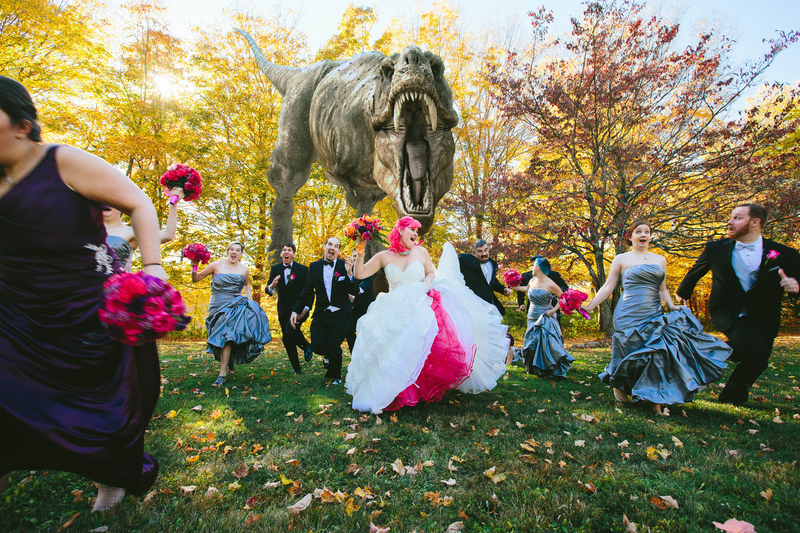 These days its pretty popular for wedding parties to pose for photos pretending to be chased by something monstrous in the background. 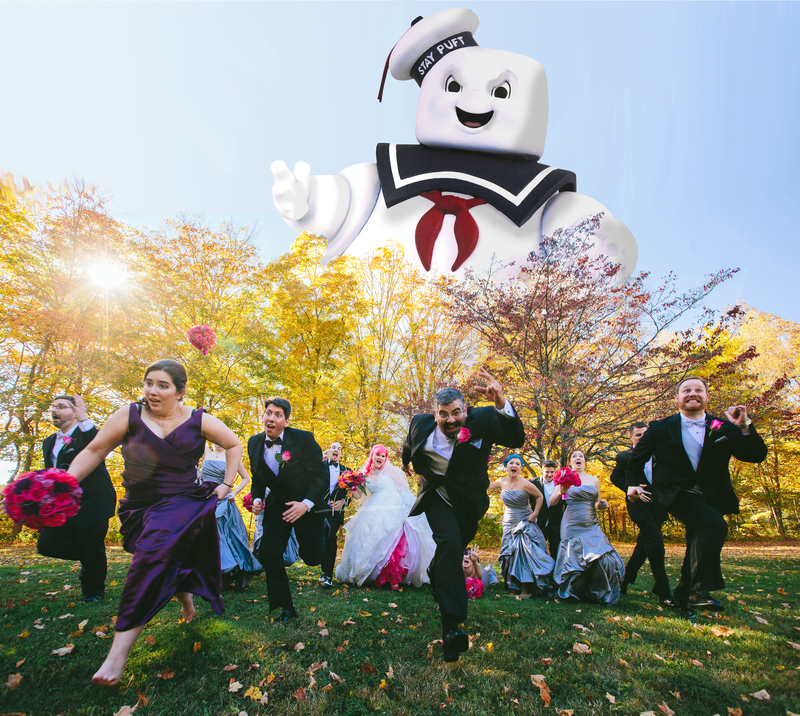 The photographer was kind enough to set that up, and the bride photoshopped a number of things into her album, starting with the traditional T-Rex, progressing into Staypuft Marshmallow Man, and degrading all the way into Nicolas Cage chasing the wedding party. Enjoy.